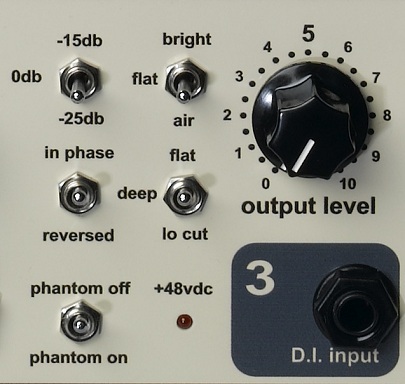 "A Classic sounding circuit with a nicely weighted bass-mid range and a smooth, creamy top"
The Sebatron Valve Microphone Preamplifier has been designed to bring back that Classic tone to digital recording and multitracking. The Sebatron VMP series (Valve Microphone Preamplifier) is available in two channel (with or without VU) and four channel formats ... the vmp-2000e , vmp-2000eVU and vmp-4000e.All circuitry is High Voltage Discrete Class A for optimal headroom, wide audio bandwidth and maximum transient response. The valve Anode Voltage is approximately +300VDC. Microphone inputs are transformer coupled for an organic 'pleasant to the ear' flavour and all signal gain is provided by the valves..Direct Inputs are available for Bass, Guitar, Keyboards and running line level signals through etc.The two-band switched Passive Equalization network and variable colour control via the Pad switches allow the user to carefully sculpt the signals when dealing with the clinical and lifeless quality of Digital (or otherwise ) recordings.Such is the organic quality and musical colouration of the VMP series circuit that they are often used to run stems (sub mixes) or full mixes through to obtain that characteristic 'Analog glue' that Digital recording systems simply cannot produce.Sebatron preamplifiers are being used everyday by Professional hi end audio studios all around the world. The VMP Series of preamplifiers from Sebatron is aimed at filling in the gap between ‘transparent’ amplification and ‘coloured’ or character preamplifiers. They can be driven lightly for pure, almost transparent sounds with just an edge of true valve tone or slammed into thick distortion, with a spectrum of colours available in between. All Sebatron products are designed with reliability and long life in mind.All units are housed in steel chassis’ with quality hardware. Everything is hand built using single sided circuit boards and discrete components for easy servicing. We refused to use integrated circuits because of their lack of character and other limitations they impose on a circuit. It is easy to produce purity from a chip, but it is nigh on impossible to squeeze out soulful tones. A properly tuned valve circuit (i.e. not a starved tube used as an effect) subtly compresses and harmonically enhances the signal in an organic and musical fashion, providing the warmth and punch associated with tape that is missing from purely digital systems. Sebatron VMP preamps have also proven popular as line level devices for adding organic richness to synths, amp simulators, stem mixes or even over a complete mix.